In ancient India the Buddha began his search into the meaning of life by going off to the woods to seek relief from the suffering that humans inevitably experience. It was while meditating under a tree that the Buddha was awakened. He called the earth to witness the sincerity of his endeavors. 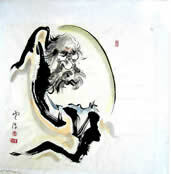 The image of a forest meditator has been prominent in Buddhism for the last two thousand years. The Buddha felt that the wilds would tear away the veils of civilization and allow sincere seekers to see more deeply into the character of human suffering and its surcease. Meditation in the Wild explores the history of forest meditation since the time of the Buddha. It presents what we know of the Buddha’s forest sojourn and those disciples in ancient India, China Japan and Southeast Asia who went into the wild emulating him. 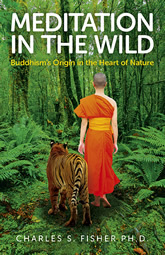 It looks at the resistance of the Buddhist establishment and how one might meditate in the wild today. Each place where forest practice was undertaken presents a different natural environment and different understandings of nature and meditation practice. Jack Kornfield, guiding teacher of the Spirit Rock Meditation Center and author of many books on meditation. Wade Davis, National Geographic Explorer in residence and author of Into the Silence, One River, and The Serpent and the Rainbow. Stephen Batchelor, author of Confession of a Buddhist Atheist. Jon Miceler, Managing Director, Eastern Himalayas Program, Director, Mainland Asia Program, World Wildlife Fund. Dorion Sagan, science writer, author of Notes from the Holocene and Cosmic Apprentice. Tim Ward, author of What the Buddha Never Taught: a “behind the robes” account of life in a Thai forest monastery. The contents and images on this page may not be reproduced, mirrored, or republished.